Covering the latest release of the open-source PHP framework, Zend Framework: A Beginner's Guide covers key features, including model-view-controller implementation, routing, input validation, internationalization, and caching, and shows you how to use them in a practical context. Detailed description on Zend Framework components and valuable hints and best practices to do more with less. 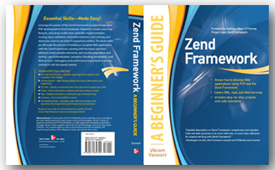 A must-have reference for anyone working with Zend Framework. The book walks you through the process of building a complete Web application with the Zend Framework, starting with the basics and then adding inmore complex elements, such as data pagination and sorting, user authentication, exception handling, localization, and Web services. Debugging and performance optimization are also covered in this fast-paced tutorial. Plus, you’ll learn how to apply your skills in the real world, with a complete hands-on project.